Giving nursing students a taste of working in nursing homes has always been challenging for universities. But the radical overhaul of nursing and midwifery education unveiled by the Nursing and Midwifery Council (NMC) in May is partly intended to make available a wider range of placements. Nurse lecturers hope that the shake-up by the regulator will pave the way for a greater number of placement opportunities in nursing homes. Under the 2010 education standards a mentor is a registered nurse who supervises and assesses students in a practice setting. All nursing students on pre-registration programmes must have a designated mentor while on placement. But there have been concerns about getting sufficient numbers of trained mentors, and the quality of mentorship. Now the NMC has replaced the overriding mentor role as part of the changes to allow universities to develop more innovative and flexible approaches. The final version of the NMC’s standards for education and training, which must be implemented for all courses by September 2020, swaps mentors for two new roles. There will be a pool of practice supervisors, who can be any registered nurse and midwife as well as other healthcare professionals, to ‘serve as role models for safe and effective practice’. These staff will support and supervise students, providing feedback on their progress and their achievement of proficiencies and skills. The NMC says these supervisors should receive ‘ongoing support’ to participate in students’ practice learning. Then there will be practice assessors, nurses who will confirm student learning on a placement but not take an active role in training. Separating support and supervision from assessment should allow a larger pool of nurses to become involved in education and training. Lead adviser on the NMC changes, Dame Jill Macleod Clark, told Nursing Older People’s sister title Nursing Standard in March that mentors’ job was ‘impossible’. In the UK, more than 400,000 older residents live in care homes and the sector provides more beds than NHS hospitals. But concerns about standards of care and negative media reports have tarnished the reputation of staff in the homes. Research has suggested that nurses consider working in care homes as low status and unattractive. 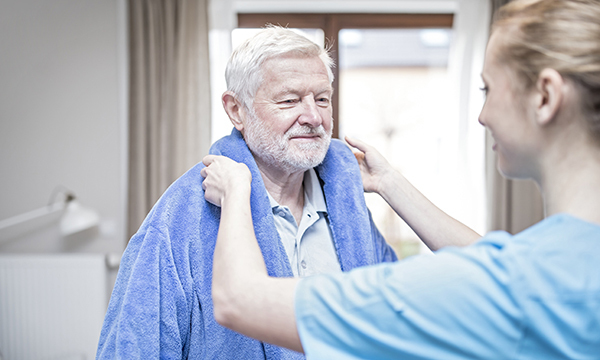 Increasing student exposure to care homes is seen as one way to improve understanding of the complexities of the care they provide but arranging placements has been beset by difficulties in the past. Senior lecturer in nursing at Northumbria University Juliana Thompson says the issues universities have faced include getting sufficient numbers of staff trained as mentors, releasing funding for mentorship training and a relatively high turnover among nurses, which means that mentors may not be in post for long. After working closely with the sector, Northumbria University now sends nursing students to about 60 care homes. The majority take first year students for two-week stints as part of their community placement, which means that a mentor is not necessary in the care home. This is more like the kind of model that will be encouraged under the new NMC education standards, where all nurses will be expected to support students. Dr Thompson is optimistic that the mentorship changes will support the increasing use of care homes for placements by reducing the pressure of developing a cohort of mentors in each home. ‘[The new system] should make it easier for nurses working in other sectors, and not just the NHS, to work with students,’ Dr Thompson says. ‘It will be better for students to have these experiences as well. Using practice supervisors will make it easier for care homes to engage, by not having to go through the mentor process. Victoria Ridgway, senior university teaching fellow at the University of Chester, agrees that getting a sufficient number of placements in nursing homes is a struggle. But, with the move to more community care set out in NHS England’s Five Year Forward View and the increasing ageing population, experience in this setting is important and useful to students. Another challenge to be overcome is students’ negative views about working in nursing homes. ‘There are a lot of negative attitudes and stigma attached to nursing older people and students just don’t want to go to nursing homes at all. There is a fear of what they do there,’ Dr Ridgway says. Research carried out by Dr Ridgway and colleagues into perceptions of nursing homes involved asking students to draw what they thought of these establishments. But when students were interviewed after a placement they reported a sharp reversal in attitude, according to the study published in 2017 in the Journal of Educational Innovation, Partnership and Change. Chester Court nursing home in Bedlington, Northumberland, has welcomed first and third year nursing students on placements in the past year. Students have reported that they were impressed by the autonomous and holistic care that nurses were providing in the residents’ home. Manager Pam Towers says four nurses have completed their mentorship training. One third year student returned for her final management placement and, since qualifying, has joined the home’s staff bank, Ms Towers says. While she would encourage other care homes to get involved with supporting students, she says she cannot imagine not having mentors on hand for them.